I'm officially a believer. I've had people suggest baby smoothies to me for a while, and I am finally reaching my threshold of cleaning yogurt and applesauce off the walls, picking up Kix (aka balls) before they get crushed by little toes, and throwing away 1/2 (read: 1/8) eaten sandwiches. I swear this child could live on air and fruit snacks, and this is obviously not ideal. In an effort to clean up all of our eating, I'm finally giving the smoothies a go. It's an easy way to use up some of our baby food and cereal we have left over too! It's amazing the things you can sneak in there and mask with some applesauce. Milo is GREAT about drinking throughout the day, so when mealtime doesn't yield great results, it's nice to know that I can still get him some fruits and veggies beyond the 3 bites of apple he ate at breakfast. Last night, I blended up carrots, green beans, a little bit of yogurt, and milk. Sounds disgusting but he loved it! This morning was apple/strawberry/banana/yogurt/milk and he's destroying it. Added bonus: he can't make a massive mess with it. I never knew you could get so much cottage cheese ground into the carpet so quickly and in so many places while sitting in a high chair. Milo has s one serious talent when it comes to food flinging (yes- we're working on it). If I can minimize the number of times I'm cleaning up the smears to 3 times a day rather than 5, I'll take it! Are you a smoothie maker? What are your favorite recipes? 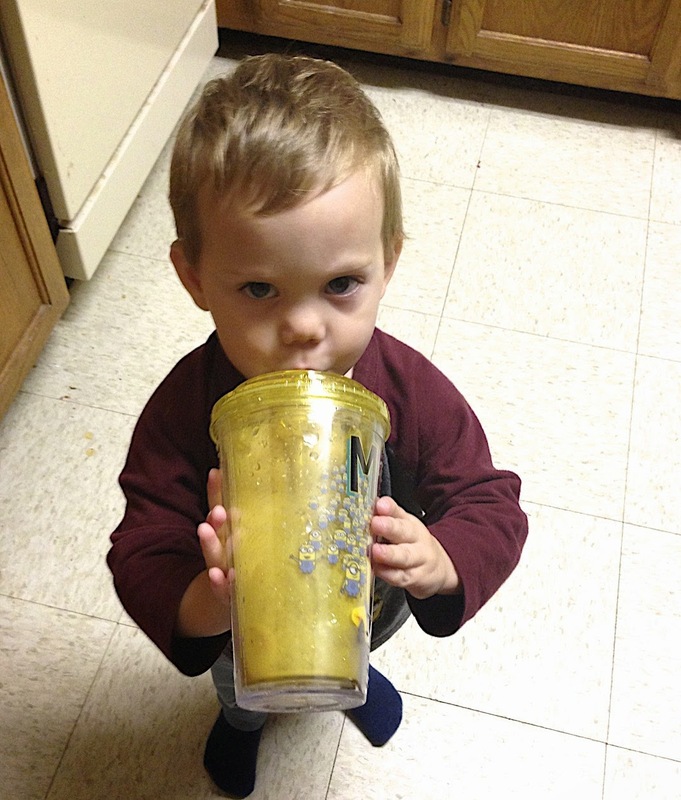 What are your other tricks to getting your toddlers to eat their healthy foods? Milo does ok, but he has never been a stellar eater (as in, he will eat 5 cheerios and 3 bites of cheese and call it good). He's gotten better, but it's a work in progress! Evie just turned one and I'm trying to get her to eat more high in good fat foods. No dice. So I thought I could sneak them in to smoothies. But I don't have a good cup for her to sip out of yet. What do you use? Frozen bananas, heck all frozen anythings, avocado, spinach: great to put in smoothies! I had this same dilemma!!! And Milo is a cup thrower/dumper so I knew I couldn't mess around when it came to a cup. I have this random minion tumbler cup with an attached hard plastic straw. We have a sippy cup with a straw too, but it's a beast to clean and Milo knows how to flick the straw and make it fling food. Which, you know. Not ideal. I do have a friend though that gives her kids (2.5 and almost 1) smoothies in a camelbak water bottle. The straws are big and I think they work well for her!!! And good call on avocados. I always forget about those but such a good source of healthy fat!